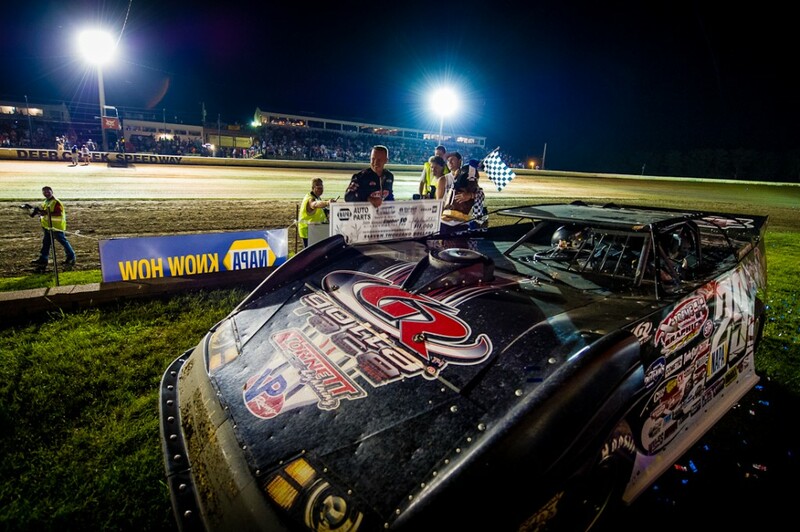 SPRING VALLEY, MN – July 8, 2013: (Photo courtesy of Gulbranson Photo) Finally a perfect day for racing saw 33 World Of Outlaw Late Models check into the back gate for action at the NAPA Auto Parts Gopher 50 Charity Late Model event. A very large crowd was on hand to partake in the racing event on this July evening. During time trials Chris Simpson of Oxford Iowa set fast time with a lap of 14.097 seconds also setting a new track record with the lap. Heat race action was won by Simpson, Darrell Lanigan, Shane Clanton and Morgan Bagley. Chris Simpson jumped into the early lead from his outside front row starting spot with Darrell Lanigan falling into second ahead of Morgan Bagley, Josh Richards and Tim McCreadie. A perfectly smooth, freshly worked track saw fast laps early in the feature. Shane Clanton moved into to the top five after getting around McCreadie on lap five. With six down Richards started to pressure Bagley for third while Lanigan pressured Simpson for the top spot. Lanigan was faster through the corners running the bottom of the speedway while Simpson kept the hammer down on the top side holding the slight edge for the top spot. With nine completed Lanigan finally worked past Simpson for the top spot while Richards moved into third. Lapped traffic came into play on lap twelve as the leaders flew around the speedway. On lap thirteen Richards worked under Simpson for second and started to close in on Lanigan up front. A caution on lap twenty four bunched the field back up with Lanigan taking the lead. Simpson’s high line moved him back into the third spot while Eric Wells, Bagley and Clanton raced three wide for fourth. 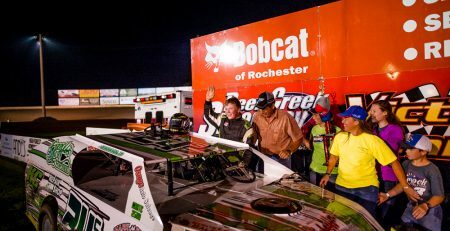 Clanton and Wells continued the race for fourth on lap twenty six as Bagley dropped out of the top five. Richards moved past Simpson again on lap thirty but was unable to gain any ground on Lanigan up front. 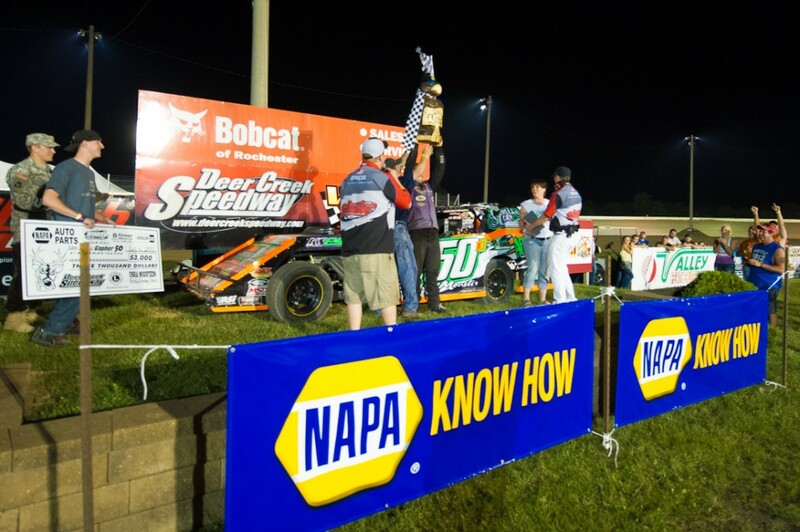 Lanigan took home the win worth $11,000 thanks to a $1,000 bonus put up by NAPA for any car displaying the NAPA decal and winning the feature event. Richards, Simpson, Wells and Clanton rounded out the five. In victory lane Lanigan hosted the trophy’s for the event with a large NAPA Know How hat from the NAPA group and a Chainsaw carved Gopher presented by Miner’s Outdoor and Rec. The final feature race of the event was the 30 lap NAPA AutoCare USRA Modified feature event. Front row started Brandon Davis jumped out front at the drop of the green. Rodney Sanders moved into second with Mike Sorensen in third. 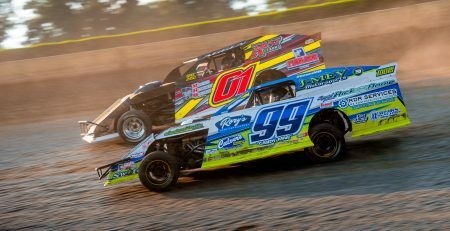 Craig Thatcher worked into the top five on lap three while further back the Modifieds were racing all over the track in a large pack of cars from tenth through eighteenth. With some crazy action further back Davis was on a groove up front. A caution with five down saw Davis leading with Sorensen taking over the second spot. Thatcher and Joey Jensen were side by side for fourth. Thatcher took the spot and started to pressure Sanders for the third spot, Kelly Shryock moved past Jensen for fifth on lap ten. Lucas Schott moved up to put pressure on Jensen. From lap twelve to the finish Jensen and Schott raced side by side for the sixth spot. Davis was all by himself up front and slowly pulled away from Sorensen. On the last lap Jensen and Schott split Shryock and to take their battle into the fifth spot. At the finish it was Davis, Sorensen, Sanders, Thatcher and Jensen in the top five. Racing action resumes next Saturday with racing in all five classes. 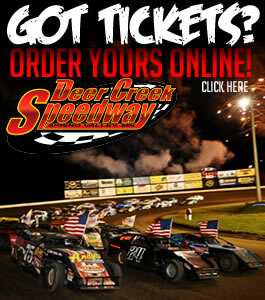 Admission will be free into the stands courtesy of the Minnesota Corn Growers.